Last year, the urgency of New York’s Reforming the Energy Vision was palpable at a two-day conference in New York City dedicated to the energy industry transformation. Fast-forward 12 months and there is less urgency amongst vendors and utilities as REV pushes forward. Many stakeholders have their heads down in working groups and filings that are part of this process, and there is perhaps a bit more skepticism. The most significant and complicated part of REV is transforming distribution utilities into platform providers for an energy market at the distribution level. REV also includes various other initiatives, some of which predate the REV proceeding, such as K-Solar, NY Prize, NY-Sun, BuildSmart NY and the state’s Green Bank. There have been tangible successes to REV more than two years in, and also frustrating roadblocks. There are so many moving parts that it is difficult to overhaul the market without destroying value for distribution utilities, and keeping vendors fully engaged while they wait for new markets to emerge. Some of the key next steps include opening the interconnection queue, which is locked in a backlog, putting forward a rate beyond net metering that is being defined as LMP+D, more data-sharing from utilities to allow market players to respond to utility needs, and utilities being incentivized with more performance-based metrics and also new earnings mechanisms in the near term. It’s been a remarkably congenial process, including an alliance between the utilities and solar developer industry for rate-making purposes, Solar Progress Partnership. Many vendors argue that more data-sharing from utilities would allow them to better tailor solutions to a utility’s specific problem, such as is happening with Con Edison’s non-wires alternative, the Brooklyn Queens Demand Management project. But beyond BQDM, REV demo projects have been incredibly slow to get off the ground, with most just getting into early operational phase now. Many BQDM projects are not particularly innovative in the context of the end goal of REV. Even Con Edison took nearly two years to craft the BQDM auction that took place in July. For those at the helm of REV, including Department of Public Service Chair Audrey Zibelman and Richard Kauffman, New York’s energy czar, the need for results is palpable. And yet they caution that to get it right, the market cannot be thrown into turmoil. 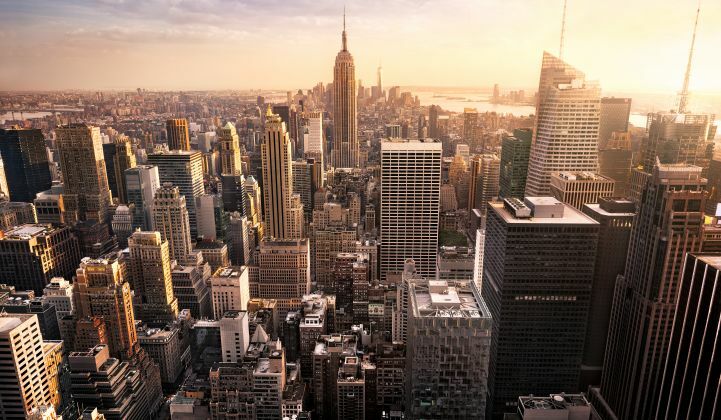 Kauffman and Zibelman point to success with the growth of solar in New York and the nearly $300 million committed by New York’s Green Bank. There is a laundry list of ongoing efforts, including new programs from NYSERDA, working groups, competitions such as NY Prize and 76West and expanded community-choice aggregation. “We have created a space in New York where innovative companies can work with utilities to build this energy system of the future,” Kauffman said at REV Future 2016. But for small companies, waiting for new rate design or increased opportunities within the REV framework is not for the faint of heart. The interconnection queue will likely not be unlocked until sometime in the first quarter of 2017, after a queue management proposal goes through the public comment period. Although REV Connect has been created, it is unclear when it will help launch future projects or how quickly those will see the light of day. Lastly, the longer process of remaking rate design is necessary and yet introduces uncertainty. “If we can create a market for some grid services, it can take the pressure off of rate design,” suggested Sean Gallagher, VP of state affairs at SEIA.